Fastmac has created a wall outlet that include two USB ports for charging your peripherals without having to plug them into a computer. My gal just showed me this and let’s just say it needs to be filed under: Why has nobody thought of this before? Typically, charging a device through your computer is considerably slower than doing it from a wall outlet (provided your device supports it). I know for a fact that my Samsung EPIC 4G will charge considerably faster when plugged into the wall than it will if charging off the USB port on one of my computers. The folks over at Fastmac have created an outlet replacement that includes 2 USB ports in a standard wall outlet; removing the need for that USB to outlet adapter. 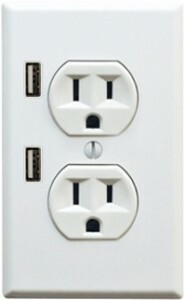 I have an outlet in my kitchen that needs this in the worst way! Now when friends comes to visit and need a charge there’s no hunting for adapters, no need for them to plug into one of my computers, etc. All they’d need is a simple USB cord (which I have plenty of) and they could just set their device on the kitchen counter, plug in, and juice it up.